Throughout the previous week, as we had explored the Sunshine Coast of Canada, Sara and I had often gazed across the water to Vancouver Island and her still snow-capped mountains. Today we were about to set out on the longest drive of our road trip, and it would take us right through the centre of the island and those beautiful mountains. 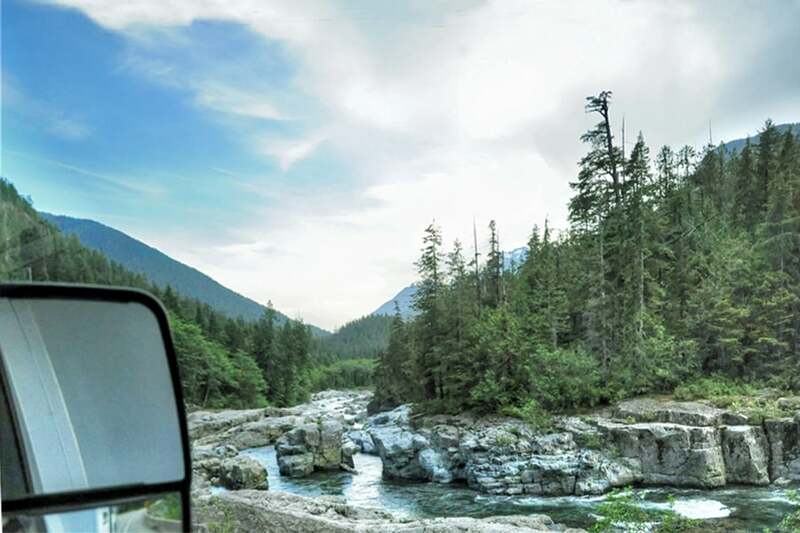 Seasoned road trippers would take it in their stride I’m sure, but the thought of narrow, winding, mountain roads, was rather daunting for us novice RVers. You’ll find a map of our route, marked with some our favourite restaurants and attractions, at the end of this post. Having caught the ferry at Powell River, we landed on the island at Comox and headed south to Qualicum Beach. I would have liked to have stopped there, as I have heard that it’s lovely, but our priority was to make it to our final destination before dark. We also wanted to make sure we had time to stop at another point along the route, Cathedral Grove. At Qualicum Beach, our route turned inland through Little Qualicum Falls Provincial Park, before passing Cameron Lake. It is here, in MacMillan Provincial Park, two short hiking trails start right on the highway. We’d been told not to miss them. As we followed the paths, ancient Douglas Fir trees, some over 800 years old, towered high above us, dripping with moss on the lower branches – the majestic Cathedral Grove. Like a scene from Jurassic Park, huge ferns covered the forest floor. It’s a magical place to wander around and admire in the dappled sunshine. This is the most accessible place on the island where you can see old growth trees, making it a popular stop. In early June though it wasn’t too crowded and we had much of the trail to ourselves. Our onward journey wound its way through the mountainous interior, with wonderful views of stunning lakes, rugged rivers, and snow-capped mountains. It’s not the easiest of drives, and our nerves weren’t settled by seeing a car crash, just as the road gets a little hairier. I’m pleased to say it didn’t look serious. In reality, our expectations of the drive were worse than reality and Sara, as lead driver, coped superbly. I was the chief navigator, which wasn’t exactly hard as this is the only road to Tofino. I was also busy trying to capture the majestic scenery with my camera. Having made it in one piece through the mountains, the road turned north, along the Pacific Rim Highway. We easily found our next campsite, Crystal Cove Beach Resort – a really lovely RV and log cabin resort, right by the beach, on the outskirts of Tofino. Handily, Crystal Cove was just across the road from my favourite car park in the whole world. Yes, a car park. Not only can you buy delicious burritos from the fabulous food truck here, Tacofino, and some seriously good burgers from Wildside Grill, you’ll also find delectable handmade chocolates, as well as artisan gelato at Chocolate Tofino. It’s worth the drive here just to taste their salted caramel in a waffle cone, dunked in chocolate. Our campsite was also within easy walking distance from Tofino Brewing Company, where we both enjoyed a beer flight. In fact, our road trip was unexpectedly turning into a bit of a fabulous food and beer tour. Yet it was neither the food or the beer that had brought us to Tofino. We were here to see the wildlife. We were both very excited about the Black Bear and Whale-watching tours we had already booked with Remote Passages. Having not seen a single whale the last time I’d been whale-watching, and being fully aware that the animal kingdom can be unpredictable, I knew sightings can never be guaranteed. Rest assured though we saw plenty of both bears and whales and many other wonderful animals, but I’ll tell you more about that in a future post. It was early June, and the weather, while we had been on the Sunshine Coast, in the main, had been glorious, reaching almost 30 degrees Celsius on one particularly sunny day. It was surprising how much colder it was at Tofino on Vancouver Island’s west coast, especially at night. It was damp, and often misty too, but it’s a wonderful little town, with a superb food scene, that attracts many wildlife enthusiasts, as well as surfers who flock here to catch the waves at the nearby beaches. The area’s remoteness, though, I’m pleased to say, stops it being overrun by hordes of tourists. Staying here felt a bit like being part of an exclusive club, for only those in the know to enjoy the town’s many charms and the unspoilt natural beauty of Clayoquot Sound. And they were prepared to make the arduous drive, along the twisting highway through the mountains, to get here. Back to our road trip, having seen bears and sea creatures aplenty, we headed south again, retracing our steps through the mountains, and on to Nanaimo. Along the way, we passed through Coombes and stopped at a little café that I wanted to show Sara, called Goats on the Roof. And quite literally it does indeed have goats on its roof. It’s a fun place to stop if you are passing that way. There’s an excellent food shop here, and behind that, a fruit and vegetable market, and behind that, a really fabulous Italian restaurant, Cuckoo Trattoria and Pizzeria. Our last campsite, Living Forest Oceanside Campground was the biggest of them all, with wonderful views of the Salish Sea and Nanaimo River. With hiking trails through the forest, river swimming and kayaking, there’s plenty to do here. The ferry terminal, back to the city of Vancouver, is just a short drive from Living Forest. And it was with much sadness that we drove our RV back to Cruise Canada. We’d christened her Persephone, after the first brewery we visited back in Gibsons, and we didn’t want to say goodbye. Zoë, The Quirky Traveller, would be picking Persephone up the very next day and driving the second leg of the #ExploreCanada Road Trip that took her through the Rockies to Calgary. And I’ll soon be writing about (and sharing many more photos of) the bears, whales and a myriad of other wonderful sea creatures, that we saw during our Vancouver Island road trip. Stay tuned! We, my wife and I with one close friend are planning to visit Vancouver, BC this summer between July – August 2019. We need the information about renting RV which one is the best os services, reasonable price, RV new model 2018 or 2019, etc. and the best hotel in Vancouver before renting RV for 3 days. So glad I reached your site… I’m just starting to think about my next year vacation in BC so I want to read all about it! And the photographs are really great!! That scenery is so vibrant and green – what a wonderful trip with great hikes, good food and drink and so much to see en route. So happy you enjoyed your Vancouver Island experience! We just moved from Vancouver to Victoria (on Vancouver Island), so now we’re “islanders.” We’re impressed you handled the RV :-). That road to Tofino is narrow and windy! But it’s incredibly scenic. Part of the fun of a trip to Tofino is the road journey. Did you get to hike the Wild Pacific Trail in Ucluelet? (Ucluelet is the fishing village near Tofino.) Snaking through the forest along the rocky coast, with waves crashing on huge black rocks, that hike is one of our favorites. No, we didn’t sadly. We did visit the aquarium there, which we both loved. We spent most of our time wildlife watching. There’s never enough time for everything. Love Victoria too. Visited last year – a fabulous introduction to Canada. Engaging posts and loving the pictures of the places in Canada! So much green and vibrant forests! I must say, you’re enjoying quite a lot of good beers, too in Vancouver like you did in Sunshine Coast! Oh yes! And let’s not forget the craft beer on Granville Island in Vancouver city too. I was a confirmed cider drinker, and have been for more years than I care to remember. This trip to Canada, however, has firmly established my preference for beer over cider now. More lovely scenery! I’ve heard lots of good things about Tofino before and will have to go and experience it for myself one day. I long to go back to see more. Can’t wait to see how you and the other bloggers all got on. Goats on the roof! They sometimes do that in Norway … beats hauling a lawnmower up there! Great to hear you’re enjoying my posts. I tried to see if you had written about your Canadian adventures but I couldn’t see a search option or a destination list. Have you written any? You were a star and I can’t thank you enough!